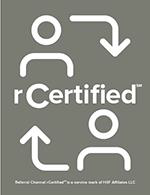 Welcome to the Referral Channel rCertified℠ Designation. The rCertified designation and curriculum is designed for referral and relocation leaders as well as real estate sales professionals who would like to gain a comprehensive understanding of, and a level of expertise in handling, business opportunities from various referral channels, where a referral fee may be involved. The relocation journey can bring an ebb and flow of excitement, anticipation, confusion, frustration, and fear. Step into the shoes of a relocating family and experience the journey through their eyes. As you are faced with these real-life scenarios, challenge yourself to find more genuine ways to connect and come alongside individuals in their relocation journey. If you have questions, concerns or comments on referrals, relocation or the rCertified℠ curriculum, please contact us.